Flying is a huge fascination for humans: we dream of it, build machines to achieve it, and are envious of those who can do it. This longing has spawned some of the best–and coolest–technology around, from video games to flight simulators. 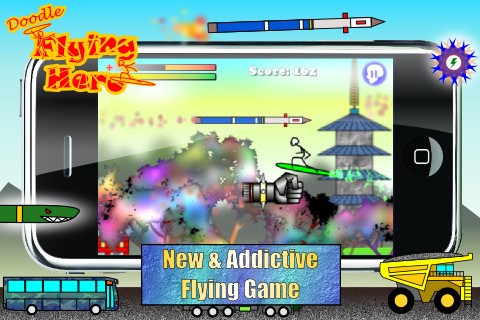 Continuing with this tradition, Keo Brothers Studio has developed a new game app called Doodle Flying Hero, in which you are a stick figure that flies through the skies on a surfboard (à la Silver Surfer), avoiding missiles and the like. The controls are simple: tap the right side of the screen to fly higher, and the left side of the screen to drop down. Avoid all missiles and nukes and aircraft flying towards you, but go for special items floating in the sky for special powers or to recover energy. Another way to recover energy is to land on the cars driving by below; land especially on ambulances (with the red cross emblazoned on the side) to recover HP. (The HP and energy bars are found on the upper left corner.) The longer you’re in the game, the more items will be flying towards you. Aside from avoiding death by missile, one of your goals is to fly over as many cars as possible before landing, creating a car “chain.” The more cars you pass before landing, the higher the bonus points you’ll receive. But careful, don’t land on anything with a nuke sign! Landing on the ground and smashing into cars will also get you killed. There are over 10 types of cars to land on, three game modes to choose from, and three locations (the newest one being in Japan!). For an extra challenge, play with only one hand. For having such simple controls, Doodle Flying Hero is a bit tough to master. For one, you won’t be able to see the cars down below while you’re in the air, so landing on something that won’t kill you becomes a bit of a crap shoot if you’re pulling a straight dive…which is what a light tap on the left side will become. Why it can’t be a slight lowering of altitude–mirroring the slight rise you’d get from tapping the right side–instead of a full-on header, I don’t know. But perhaps this mismatch in control is just the right amount of added difficulty. While the stick figure sky surfer is obviously not an impressively complicated bit of graphic arts, the backgrounds and objects around him are surprisingly very nicely rendered; it balances out quite well. The music and sound effects are also exciting complements to an action game app. Doodle Flying Hero, with its uncomplicated controls and objective, will be a bit of a sleeper hit by having you automatically reach for the Retry button. AppSafari review of Doodle Flying Hero was written by Julie Guan on June 7th, 2010 and categorized under Action, App Store, Fun, Games, Physics Based. Page viewed 3387 times, 1 so far today. Need help on using these apps? Please read the Help Page.